I believe stress eating and eating because you’re bored follow the same pattern. You’re feeling something, and you’re unsure what it is, but it makes you uncomfortable. Then you feel stress or boredom. 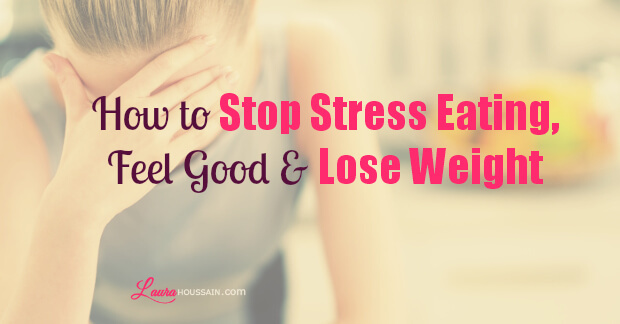 In this case, stress then becomes really hard to handle until you reach for your favorite fix—food. In other words, stress eating is just an upper layer of emotional eating, but more about that in a minute. It seems from scientific research that eating creates a cascade of bodily responses that make you feel calmer. In other words, different foods can serve as anxiety pills. You may feel that you are not soothing your nerves but, if you’re a stress eater, food is your chemical stress suppressant. So if you want to learn how to stop stress eating, first acknowledge that food has been your drug, and then decide to find new ways to alleviate stress now. Done? Great! …. 1) Monitor your breath a few times throughout the day and make sure your breath is deep in the abdomen to prevent unnecessary stress buildup. 2) Practice deep breathing twice a day. Sit up straight in a chair. Put your right hand or both hands on your heart and imagine that it’s emitting a constant flow of unconditional love. This simple technique, if practiced eight minutes twice a day, will bring you incredible benefits over time. Subscribe to my newsletter to learn how to do this. Your stress levels will go down amazingly fast, in just a matter of minutes, and you’ll wonder how you have been able to survive without this. Actually, I will teach you how to stop emotional eating and lose weight using this beautiful technique. I can’t tell you how blessed I feel to have good friends in my most vulnerable moments. I know my life would be much more stressful if I didn’t have a few people I can call out of the blue and who are willing to just be present with me in the moment. It’s amazing how relaxing it is to know this. You can get the same thing from a spouse, but I feel it’s best to have several good friends in your close circle as well. Positive people will help you look at the positive side of things and get back to feeling well and positive yourself. Practice all the above techniques to relieve stress. Many will help you reconnect to your feelings as well. I am a hypersensitive person. Handling emotions has been a very big challenge all my life, but I have discovered that, if I could find a way to choose my thoughts and emotions, being hypersensitive could actually become a great asset. Think about this like this: If you can feel enthusiastic ten times stronger than the average person, you can feel ten times more energized and influence others as well. Byron Katie has written a beautiful book and created a very simple exercise called “The Work” to help you reconsider your thoughts and your beliefs. I’ll let you Google it. Give it a try, and you’ll never be afraid of your emotions again. I could go on and on. I have collected a large number of simple techniques to welcome my emotions, be present to myself, process them, and reconsider the thoughts and beliefs behind them. I feel it’s much more productive and empowering than procrastination, emotional eating, or day-dreaming, which are all escape mechanisms. I’m such a hypersensitive person though; I wish a teacher had taught me this in kindergarten. Unfortunately, no one ever did, and I experienced years of stress, addictive behaviors, and an emotional roller coaster before I was able to break free. I sincerely hope that this information has triggered your curiosity and that you’ll use at least two or three of these techniques today and enjoy immediate benefits. I know you can’t use them all at once, but consider mastering them one after the other. I wish someone had handed me the keys to breaking free from stress eating, smoking, procrastination, and compulsive self-sabotage. I’m so happy to be sharing my keys with you today. One last piece of advice: Try to define clearly what matters the most in your life, and keep your eyes on the prize at all times. It will make you more resilient and immune to stress. Actually, this is the secret used by most sports champions who win the gold medal. Win your gold medal by mastering your emotional response to life, feeling good most of the time, and always choosing to be good to yourself. This will give you enough joy and peace of mind to embrace a healthier diet, let go of compulsive behavior, and see the good side of life. If you want to learn EFT to stop stress eating, subscribe to my newsletter now, I’ve got great videos for you. EFT information please. Thank you. I give access to EFT training videos at no cost to anyone who subscribes to my newsletter in the header or at the bottom of this post. They are easy to understand and use. You can watch them and unsubscribe if you don’t like them. (I hope you do and stay). Awesome information . Nice post with some nice tips. You’re most welcome Vishu. I’m delighted to read your comment.